Sometimes children are born with an eye condition, however it’s not typically recognized until school age. With L, I knew something wasn’t right just before age 3. Our immediate family didn’t have a history of eye conditions, but I followed my gut instinct and made a pediatric eye doctor appointment anyway. Sure enough, he was diagnosed with a few conditions, one of those being estropia – that’s when one eye turns inward. The doctor said we had a fighting chance to correct his vision because it was caught so early. I was so relieved! 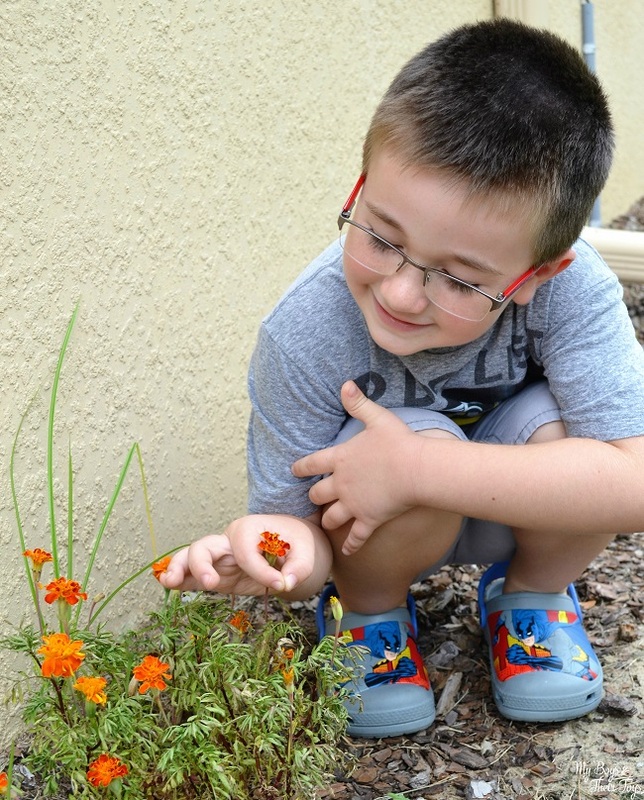 He’s worn corrective glasses ever since, and gets quarterly check-ups with his eye doctor. His eye conditions have improved greatly over the last 2 years, and we couldn’t be happier. 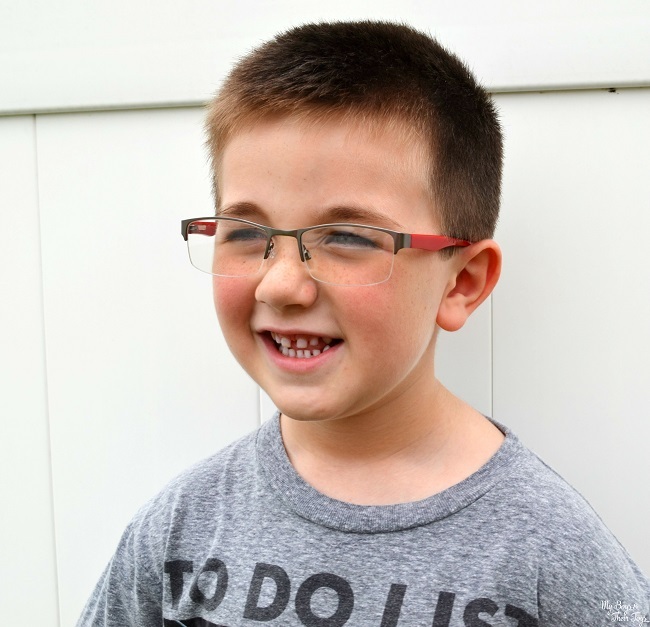 Doesn’t he looks super cute in his Arizona red metal frames from JCPenney Optical? Speaking of JCPenney Optical, they are having a huge back to school sale through September 9th. 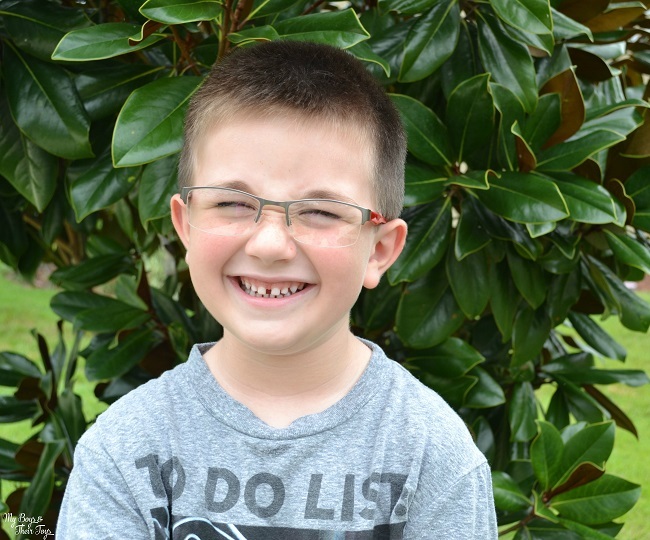 Parents can purchase one pair of kids’ glasses for $39.99 and get a free eyeglass protection plan (to protect against kids just being kids). *Valid for kids 16 and under. Not only do they have a back to school sale for kids, but they have a Labor Day promotion that includes 60% off 1 pair of glasses through 9/5, so everyone benefits! 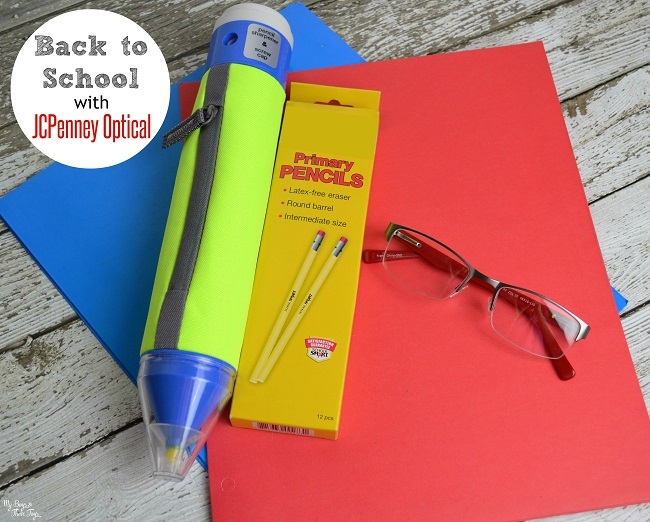 I highly recommend including a yearly eye exam in your back to school routine, then check out the great savings at JCPenney Optical! Now your kids will be sporting a cool new accessory at back to school time. JCP has it all! We love it there! 🙂 Like a second home lol. This is a great deal, I love JC Pennys! 🙂 My 7 year old daughter just found out she needed glasses about 6 months ago. I love the cute styles that they have for her to choose from! My boys have regular check ups because they were preemies – so important to see how their eyes have changed and if they need glasses. So far no need but I’m glad we have stayed on top of checking them. I am glad that your son was able to get help. JCP really has everything. Sounds like a great deal. I could use another pair the kids keep breaking mine. JCP is a great resource! This post really resonates with me as my husband has had 2 emergency eye surgeries this summer. It’s so important to care for our eyes! Wow Debra – I hope he’s okay now! He DOES look cute and I love JC Penney’s! Your son is absolutely adorable. What’s more is he looks and will be even smarter in school because he has one of the most important tools of success to do his best: 20/20 vision.